In Roman times, roofing tiles were made in Tegelen along the Meuse River. In 1394, Otte von Holtmeulen came into possession of the castle, which still bears his name today. In the 17th century, the von Metternich family became its new masters, but they allowed the castle to deteriorate badly, until the von Hundt zum Busch family moved in and rebuilt it. Like other European castles, Holtmühle enjoyed a succession of aristocratic owners, who would go to great lengths to restore the property, only for later generations to die out or move away, leaving the castle to fall to ruin. The estate belonged to the van Basten Batenburg family for nearly a hundred years, until they sold the castle, the outbuildings, and the surrounding land to the municipality of Tegelen. After a major restoration in 1993, the hotel was opened to the public. If you’re staying here during the summer months, be aware that there is no air conditioning—something that is not unusual for castle hotels. The hotel has Wi-Fi, but be prepared for steep charges. It’s ridiculous. Venlo is roughly halfway between Eindhoven and Duisberg, Germany. Tegelen, where the castle is located is just a few km southwest of Venlo. Your own car is the best way to get around the area. The nearest train station is in Venlo, but it’s a little far to walk. This hotel still retains enough architectural features to give it a castle-like feel. Indeed, driving up a cobblestone road lined with tall trees to a tower entrance makes a great first impression. The best castle feature here is a water-filled moat. A couple of outdoor terraces are the perfect place to enjoy a drink and watch the resident ducks and swans swim by. The one incongruous feature that really leaps out, though, is the cement and glass annex that connects the old building with the new wing where most the guest rooms are located. (Who thought of this?) It may not be what you want in a castle hotel. That said, the guest rooms throughout the hotel are tastefully decorated, modern and comfortable. Deluxe rooms are in the new wing, also called the “pond wing” and have views of the pond and moat. Superior rooms, which are more spacious with an added sitting area, can be located in the pond wing or the original building. Bathrooms come equipped with a separate bath and shower. Other rooms in the castle wing have king-sized beds. 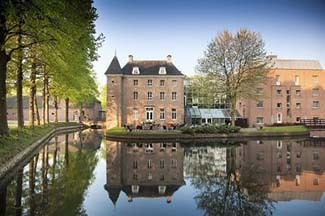 Enjoy a fine dinner in the “Die Alde Heerlickheijt,” under a vaulted ceiling in the castle cellars (make a reservation). If the prices are a little high, you can always go into town for a more informal meal. Beautiful, relaxing grounds and atmosphere.